Today’s session begins with a demo from personal genomics outfit 23andMe, brought onstage by Kara and Walt. Founded by Linda Avey and Anne Wojcicki (wife of Google’s Sergey Brin), the company is among those pioneering Web-based, direct-to-consumer genome services. Today the two will talk about 23andMe’s newest effort, 23andWe, which will conduct large-scale genome-wide association studies with the help of individuals willing to share information about their health and other personal traits. Avey and Wojcicki take the stage. 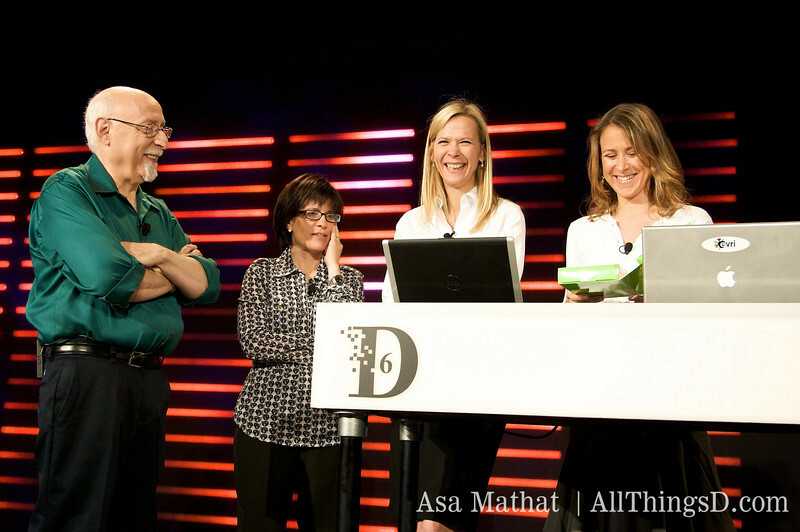 They note that attendee Esther Dyson (and 23andMe board member) has over 30 family members signed up for the service, before giving a brief overview of their genotyping tools. Simple as a spit-test, apparently. Company was born out a frustration over the genetic industry’s statistical powers. With 23andWe, the company hopes to dramatically accelerate the pace of genetic research by empowering the public to come together themselves to fuel new studies. Walt asks if these studies will be peer-reviewed, and they will. Demo involves a sort of old-media-versus-new-media DNA-off: Google founders Sergey Brin and Larry Page and CEO Eric Schmidt versus Kara and Rupert Murdoch. 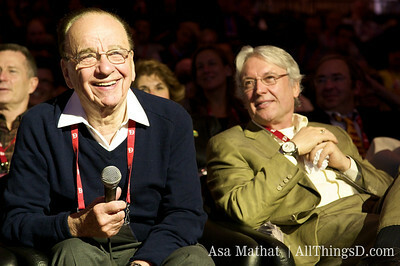 Is Rupert Murdoch lactose intolerant? Murdoch says no. According to 23andMe’s analysis, that’s true. Kara and Brin, unfortunately won’t be making any trips to the ice-cream store. “There go the dairy ads,” quips Walt. Wojcicki asks Murdoch if he would prefer a long-distance race or a sprint. Murdoch says neither. Wojcicki says his genetic info suggests he’d be a great long-distance runner. Moving on to the 23andWe demo. Question to the audience: How many people can smell asparagus in their urine? Uncomfortable giggle, raising of hands. Murdoch volunteers to fill out 23andMe’s survey: Do you sneeze in bright sunlight? Do you wear glasses? Any cavities? (Lots, says Murdoch.) Freckles? Lots. Right- or left-handed. Does your urine smell after you eat asparagus? Murdoch doesn’t think so. The survey finished, 23andMe crunches the data provided. Turns out most people don’t sneeze when they see sunlight. Lots of people have cavities. Lots of right-handed folks. And a fair number of people do not notice the smell of their urine after eating asparagus. Reviewing Kara’s data for information about her two sons. Turns out neither is related to Rupert Murdoch.